The Finnish cellist Anssi Karttunen is one of the most renowned and versatile musicians in the classical music world today and enjoys a busy career as a soloist and chamber music player. He performs on modern cello, classical and baroque cellos and on violoncello piccolo. Anssi Karttunen performs all the standard cello works, but has also discovered many forgotten masterpieces and arranged a number of pieces for cello. He is a passionate advocate of contemporary music and his collaboration with composers has led him to give over 50 world premieres of works by composers such as Magnus Lindberg, Kaija Saariaho (including Notes on Light in 2007, which he recorded; ODE 1130-2), Rolf Wallin, Luca Francesconi and Tan Dun. Anssi Karttunen has worked with outstanding orchestras such as Philadelphia Orchestra, Los Angeles Philharmonic, Philharmonia Orchestra, BBC Symphony, London Sinfonietta, NHK Orchestra, Tokyo Philharmonic, Tokyo Metropolitan Orchestra, Orchestre de Paris, Orchestre National de France, Orchestre Philharmonique de Radio France, SWR Symphony Orchestra, Munich Philharmonic, Ensemble Modern, Rotterdam Philharmonic, Residentie Orchestra, Dutch Radio Philharmonic, Dutch Radio Chamber Ochestra, Barcelona Opera Orchestra, Barcelona Symphony Orchestra, Swedish Radio Orchestra, Danish Radio Orchestra, Oslo Philharmonic, RAI Torino, Luxembourg Philharmonic, Finnish Radio Orchestra, Helsinki Philharmonic, Avanti! and many others. He performs at major festivals in Europe including Edinburgh, Salzburg, Lockenhaus, Spoleto, Berlin, Venice, Montpellier, Strasbourg and Helsinki. Anssi Karttunen was born in 1960. His teachers included Erkki Rautio, William Pleeth, Jacqueline du Pré and Tibor de Machula. Between 1994 and 1998, he was Artistic Director of the Avanti! Chamber Orchestra. He was also Artistic Director of the 1995 Helsinki Biennale and the Suvisoitto-Festival in Porvoo, Finland from 1994-1997. 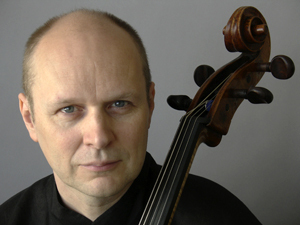 From December 1999 to June 2005, Anssi Karttunen was Principal Cellist of the London Sinfonietta. He has also appeared as conductor: in February 2000 he conducted Lindberg's Kraft in Antwerp on short notice and in January 2003 he led the Los Angeles Philharmonic Cello Ensemble. Anssi Karttunen plays a cello by Francesco Ruggeri.